Automatically show the entire note when you drill down to an item that has a note but no sub-items. That probably sounds really confusing so let me explain. I keep the default note view set to “1 line”, and I often put a lot of stuff in the note instead of creating nested sub-items. When I click on that item, I want to see the entire note without having to click on the note to expand it. This is especially annoying on the mobile app, because the keyboard pops up when I click on the note. I often just want to read the note instead of edit it. If this still doesn’t make sense, Workflowy works exactly this way. 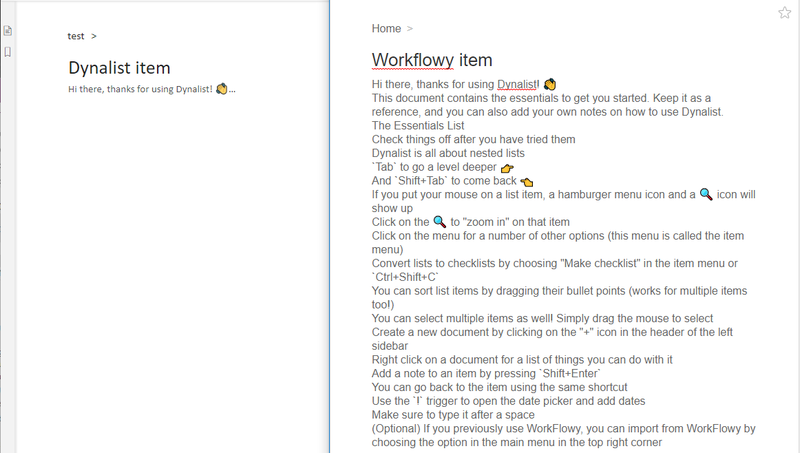 Here is what Dynalist and Workflowy look like when I drill down to the item.